“My sighting happened as my husband and I were driving around at night in the late autumn of the year about 2010 or 2011. I was on the passenger side just idly looking out my window when I seen something crouched down beside a white car. It started running alongside my truck the opposite side of some parallel parked cars on the road. The way it ran was akin to a cheetah in fast motion, the hind legs were lunging all the way forward past the front ones. I seen that it was very skinny, I could see the vertebrae of the back, ribs and shoulder blades. After about 50 meters there were some houses so it stood up on its hind legs and turned its head, which swiveled on its shoulders like a human, and looked dead at us long enough for me to get a really good look. It took a quick glance into the woods and in a single bound leapt the whole length of the cut line, about 15 feet. The sighting occurred near Fort McMurray, a growing community with a brisk oil sands industry. I asked for further details about the creature, especially since the woman first estimated its height at about nine feet! She wrote back to say may have been shorter than that. Her first guess was based on a quick comparison to a six-foot fence in the vicinity. The creature’s head stuck above the fence, she said, but thinking about it later she thought she might have over-estimated just how far above the fence it was. Guessing the height of any large, moving creature from a moving vehicle is always a tricky business, but it seems this beast had to at least have been well over six feet tall on two legs. 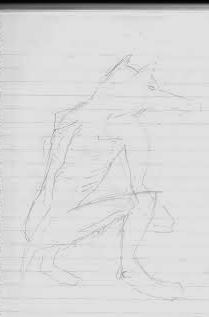 It’s interesting to me that, given the amazing amount of wilderness area Canada possesses, that the creature would have shown up on a busy road in a residential area. But Ft. McMurray is located at the confluence of the Athabasca and Clearwater Rivers, surrounded by forest — typical shelter areas for these cryptids. As for its appearance, I do get reports of dogmen with short, gray fur — the typical color of many Eastern Timber wolves. This creature is also definitely canine, judging by the long snout, pointed ears and tail. Its behavior seems more motivated by a desire to disappear from view rather than intending to taunt the witness, and the witness only suggested it was annoyed at being seen. The great speed and leaping ability it displayed are characteristics I’ve heard often. The hand-like paws are a bit more rare among the reports I receive, but as I’ve often noted, many witnesses have said the paws were elongated but were still not true, human-like hands. The dew-claw- like “thumbs” argues a little to that point, I think. And the creature was running on its toe pads rather than flat-footed. As always, many thanks to the eyewitness for sharing her experience. I can’t help but wonder if any of those other drivers on that busy street also saw the creature.